Celebration of the underground uniting of New York and New Jersey. Standing, left to right, are engineer-in-chief Charles M. Jacobs, engineer and tunnel designer J. Vipond Davies and H&M president William G. McAdoo. Photo: "The Hudson and Manhattan Tunnel in Picture and Story" published in 1908. The H&M’s system was initially conceived in 1874 as a solution to the problem that the nation’s largest city is separated from the rest of the country by the mile-wide Hudson River. All passengers and freight arriving by trains from the west had to be off-loaded onto barges and ferries at terminals along the New Jersey shore. Some days the river was impassable or dangerous due to heavy fog or ice. The original audacious idea to build a tunnel beneath the Hudson that would link the rail terminals in New Jersey to New York belonged to Colonel D.C. Haskins, an engineer who in the 1860s was involved in the building of the California Pacific Railroad. He raised $10 million for the undertaking. His first attempt made it just 400 yards into the river from Jersey City before it failed tragically in July 1880 with a tunnel collapse that killed 20 sandhogs. At an inquest into the deaths held a few months later, Haskins' project was derided as "unscientific" by the coroner. Nevertheless, the jury held Haskins blameless, noting that "like all great undertakings, this enterprise may be considered a bold one; and some portions of labor connected therewith may be deemed extra hazardous." Haskins revived the project in 1890, raising $2 million more from English investors, but after extending the tube 1,800 feet further under the river, his company went bankrupt and he abandoned his dream. The project lay dormant until 1900. With new engineering, improved tunneling technology, dynamic leadership, and massive private investment, the H&M took over and completed a fully electrified rail system. The first leg across the river was opened in 1908, linking Hoboken with Grove Street station in Greenwich Village and then running over to 6th Avenue and north to 19th Street (later extended up to Herald Square). 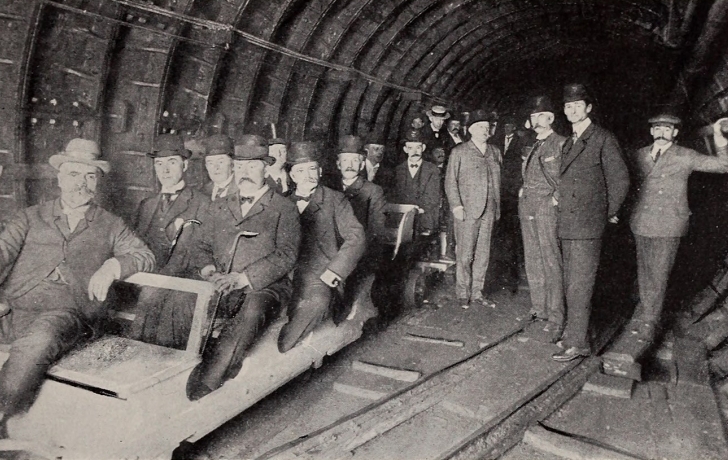 The second set of tunnels, from Jersey City to Cortlandt Street in Lower Manhattan, was completed in 1909. Ambitious plans to connect to Grand Central Terminal and the Lexington Avenue Subway at Astor Place were begun but never completed. But that incredible engineering feat was just one part of the H&M story. Above the H&M’s main terminal in New York on Church Street, where the Oculus mall and transit hub at the new World Trade Center now stand, were two magnificent office buildings, New York’s original twin towers. They were known as the Hudson Terminal Buildings. When built, this was the world’s largest office building complex, filling four city blocks on Church Street between Cortlandt and Fulton. These identical and brilliantly designed buildings—dense 22-story towers containing 4,000 offices, 20,000 office workers, an array of shops and restaurants, and rooftop gardens overlooking the river—were connected above grade only by a third floor elevated walkway spanning Dey Street. Along its western side, on Greenwich Street, ran the Ninth Avenue El, which wound its way north on Greenwich Street through what today is Tribeca. The Hudson Terminal Buildings would occupy the site until they were demolished to make way for the original World Trade Center. The razing of these buildings can be seen as on par with the infamous destruction of Penn Station, which began in 1963, but there appears to be no record of anyone complaining. There is not even a historical marker to note its long existence and formidable presence. All that remains is a small “Hudson Tubes” directional sign near the E train platform at the World Trade Center station. Surely few notice it or know what it means. The H&M was phenomenally successful and well-regarded for many years for high-quality service. It reached a peak ridership of 113 million passengers in 1927; coincidentally, that was the same year the Holland Tunnel opened. Due in no small part to the rise of the automobile and the build-out of New York’s highway system after World War II, the H&M began a slow decline. By 1958, traffic had dwindled to 26 million passengers and the H&M was bankrupt. The company’s assets, including the Hudson Terminal Buildings, were sold to the Port Authority in 1965 as part of the complex deal between New York and New Jersey that would result in the replacement of the Hudson Terminal Buildings with the original World Trade Center complex. The money-losing H&M rail system that the Port Authority reluctantly inherited (the bargain it struck to gain control of the real estate for its ambitious WTC project), was re-branded as the PATH train and gradually upgraded and improved. Ridership ultimately rebounded with the resurgence of New York City’s economy that began in the 1980s, as well as New Jersey's burgeoning riverfront communities and other factors. Last year, its ridership was 82.8 million. Like the Hudson Terminal, today's PATH station contains five tracks and they are aligned as they were in the original H&M station. A small but fitting reminder of the magnificent and underappreciated trans-Hudson rail system built by the H&M more than a century ago.